Solar and wind in India will remain uncompetitive for the next 25 years. Re: Solar and wind in India will remain uncompetitive for the next 25 years. India is set for a period of rapid, sustained growth in energy demand: how could this re-shape the energy scene? Sounds like carbon energy is here to stay for a while. Regarding the Bangladesh, it was a good insightful article on all the problems they face right up until they said the solution to all of the problems is for the west to stop pumping carbon dioxide into the air. Here is a host of problems related to lack of housing, to the nature of the geography and devastating affects of hurricanes on river deltas, over population and all the attendant ills, poverty, a multitude of other problems and yet the only real answer is to ignore all these problems and instead stop adding carbon dioxide to the air?!? Climate change has become the new excuse to do nothing. When I was a young woman, the excuse to ignore human misery and do nothing was “We have to address the root causes.” Now that excuse has become a single root cause “climate change”. From ISIS to Bangladesh these problems are all supposedly caused by climate change, and climate change alone, and these problems can only be fixed by reducing carbon dioxide emissions in the west. Shame on us. Given the minuscule reduction in global temperature from any efforts re CO2, The article borders on ludicrous. Since I am particularly interested in stories about sea level rise, I spent some time reading about the challenges Bangladesh faces. As you say, they are numerous and extremely complex. They also could have been foreseen 100 years ago given the explosion in population and the kind of resources in the region. This kind of article is all too common when global warming is involved. I particularly enjoyed one study where the author criticized other scientists for seemingly using newspapers for their sources rather than actual scientific papers. Global warming activism is a solution looking for a problem. In government hands, the futile crusade is a colossal waste of scarce resources that could otherwise go to address human needs and here-and-now problems. It’s time to dismantle the Berlin Wall of climate alarmism, from emotional scientists working from the story to the science, to intellectuals speaking power to truth, to politicians giving themselves a new charge in life, to crony capitalists feinting green. May COP21 bring disappointment, failure and rethinking–not more government control over human freedom. “Solar and wind in India will remain uncompetitive for the next 25 years. These are not really competitive anywhere once the extra grid and storage costs are included. Maybe solar someday. Wind will have to wait for the cost of competition to skyrocket. There is no real honest data that proves or even indicates that more CO2 emissions cause any problem. There is a lot of real honest data that proves that more CO2 emissions have huge positive influence on how well green things grow while using less water. Reducing CO2 will make green things not grow as well and they will need more water. That would kill many people. Does the Left believe humanity faces the greatest danger from ISIS or India? Like China before it, India’s economic growth will be fuelled by coal. Reflecting this, in 2012 45% of total primary energy demand and 72% of generated electricity demand was met by coal. India currently has approximately 205 gigawatts (GW) of coal-fired electricity generation capacity, this will soon be augmented by 113 GW of new coal-fired capacity currently under construction. Both with regressive policies, energy in both and water in one. The poor paying to subsidize the rich. CPI says $16.5 trillion in spending is needed to meet the United Nations’ goal of limiting future warming to 2 degrees Celsius by 2100. 1.) $16.5 trillion, how did they arrive at that number? 2.) How did they model projections to arrive at 2 degrees by 2100? 3.) How quickly do they need that money to make the quota? 4.) What is the energy solution to get to the magic number? 5.) Whose going to pay for it? The basic problem with global warmers is they are always ahead of the data. They didn’t even have a study result on actual forcing until this year and the forcing, while measurable, is low. They don’t have any hard data, empirical measurements, to support claims above 1°C for a TSR. There is something intrinsically dishonest, hypocritical, exploitive, fraudulent, corrupt, swindling, cheating, double-dealing, and unethical about the global warming position, their approach to debate, and the analysis and treatment of data. A global warmer study or a global warmer’s opinion and five bucks can get you a cup of coffee at Starbucks. Global warmers insist on a hard deadline and urgent action. There is no hard deadline and it isn’t urgent. We have 30 to 40 years to get the facts right even under the worst case scenario. There is no reason to let global warmers herd us like cattle. Before we wander over the global warmers particular financial cliff, we really should do a little investigation. Man does a lot of things. Some of them have negative consequences. Some have consequences we might actual want to mitigate. Virtual harm from virtual problems is not something we want to mitigate. 1. The earth isn’t perfect. It averages about 400 bq/kg, has a mix of mercury and other dangerous, elements, virus, bacteria, etc. The air is periodically polluted by volcanos, wildfires, etc. It has never been perfectly clean and never will. 2. Aiming for perfection – zero pollution – is simply stupid. Aiming to avoid harmful outcomes from proven problems is smart. Aiming for perfection – zero pollution – is simply stupid. Calling CO2, “pollution” is stupid. 6.) Who is going to receive the money? 7) How do we measure whether those in 6) earned it? Having just returned from Germany, I found the discussion about electricity prices discussed by Germans quite interesting. It seems that where I was (Western Border) the price of electricity paid by residential consumers was split between daytime (6 AM to 8 PM) and night time. The cost per kilowatt hour? 0.49 Euros day time. I didn’t hear the night time price. What was most interesting was the industrial price 0.26 Euros. Residential price is subsidizing industrial because there would be NO manufacturing jobs at day time cost. Another tidbit I picked up. The Prime Minister Merkel’s closure of Germany’s nuclear power plants and reliance upon windmills and solar will lead to a deficit in electricity when the sun doesn’t shine and the wind doesn’t blow. The German ministry of electric power or some such thing expects the deficit to be filled by purchasing electric power from the French nuclear power industry. The German ministry of electricity says that the purchases from France will continue until there is a cheap industrial capacity storage system for electricity. I didn’t hear which new electricity storage system was being developed nor when it would come on line. I recall something from WW II, “A bridge too far.” Seems apropos with the German ministry of phantom electric power. Angela Merkel’s title is Chancellor not Prime Minister. I ran across this story from AP’s Seth Borenstein in which he claims to fact-check the presidential candidates on climate change. To me, it is particularly amusing when the fact-checkers (and the “journalist”) are so biased they can’t even hide their bias. Enjoy. Liberal professors chosen by liberal “so called” professional scientific societies. Long ago, the ceased to be professional. superchill, you have them pegged. I would argue that most of the comments are fairly well known to people who follow the debate. They pretty much knew who they were ranking. Below Clinton’s 94 were O’Malley with 91; Sanders, 87; Bush, 64; Christie, 54; Ohio Gov. John Kasich, 47; Kentucky Sen. Rand Paul, 38; Fiorina, 28; Florida Sen. Marco Rubio, 21; businessman Donald Trump, 15; retired neurosurgeon Ben Carson, 13; and Cruz with 6. Knowing what I do know about climate and extreme liberal thinking and what I heard from these people, I would feel very good about just turning this totally upside down. The people doing the judging use flawed climate model output and flawed theory and flawed thinking (or not thinking) People who are skeptic and question the consensus go to the top and people who blindly follow the consensus go to the bottom. The Archives from the “At The Crossroads Energy & Climate Policy Summit” are available. The recordings are identified with day and time. The agenda can be used to find who you do want to hear. The Archives can be found on the right. Last presentation at the top. Scroll down for the first. full text is behind a paywall. This is decades away from commercial success or practicality. I think one day one of these will be scalable and cost-effective, but no one (imo) can say for sure. I think this may be the article in question. IMO it’s not as far away as you imply, but also, IMO, a simple electrolysis approach is much nearer, and will work just as well. The electrolytic H2 can be fed into a bio-reactor, along with CO2, to produce the needed gas/liquid fuels. Prototypes are already in work. Alternatively, it can be fed into a fischer-Tropsch reaction which gets pretty good efficiency. The key point, IMO, is this: solar PV costs are decreasing in a roughly exponential fashion, with halving every 5-6 years. There’s technology already out of the lab that means, IMO, another 3-4 cost halvings already in the pipeline. As these cost declines manifest, energy efficiency is going to become progressively less important relative to other cost-efficiencies. For instance, with the right design, electrolysis, and CO2 extraction from sea-water, can be accomplished without inverters. Thus removing one of the less quickly-declining costs for the system. Storage could well be accomplished at moderate depths in the sea, under the native pressure of the reactions in question (eliminating both capital and energy costs for compression). Alternatively, it might be more cost-effective to simply feed whatever is created into the bio-reactors, or Fischer–Tropsch reactors, on the same intermittent schedule as the energy becomes available. This would depend on the relative capital costs for H2/CO2 storage vs. conversion plant. I suspect that bio-conversion plants could be built with very low capital costs (after appropriate learning curve and with appropriate economies of scale), perhaps allowing storage to be bypassed, except for second/minute scales. Storage to balance daily production might be more cost-effective if the Fischer–Tropsch process is used, given the high temperatures involved. OTOH, it’s possible that with mass-manufactured micro-converters, the warm-up time could be brought down to a similar time-frame. The biggest obstacle to using a very large number of micro-converters is the issue of controlling all those independent processes. But here, Moore’s Law can predict the continually lower cost of such control technology. Especially given that the software is essentially infinitely replicable. Burning any fuel is a horrible way to extract energy. Usually at least 70% of energy is lost. Our organisms are much more efficient. And what little power is generated is generated capriciously. As these cost declines manifest, energy efficiency is going to become progressively less important relative to other cost-efficiencies. IOW, your objections about energy efficiency are irrelevant, immaterial, and beneath my notice. AK, none of the engineers on the forum has any profound objections to renewables if they competed on a level playing field and were not too large a fraction of the energy mix. The US produces 4100 TW-H. The subsides are $24 billion, 2/3 to renewables. We’ll leave aside the fact the “subsidies” for fossil are legitimate business deductions and just compute the subsidy per kwh. The “subsidy” in general is 5.854E-004 cents per kilowatt hour. That is 3 times too high because only a few percent of US energy is renewable. But I think everyone would be happy to give renewables a subsidy of 5.854E-004 cents per kilowatt hour (three times their fair share). if renewables are viable with a subsidy of 5.854E-004 cents per kilowatt (three times their fair share), then I am fine with renewables being installed. 1 Kw-H is 3412.142 BTU. According to the EIA fossil fuels average efficiency is 33-44% (depending on type). New combined cycle gas turbines should have higher efficiency than this. You’re making a category error. I don’t want to talk about <ldquo;renewables”. I want to talk about specific technologies. I’m also not interested in talking about any sort of “energy efficiencies” WRT different technologies. Especially those you lump into the category of <ldquo;renewables”. What matters is cost-efficiency. The key questions revolve around how much it will/would cost to provide the energy availability our society expects. Along with the marginal cost of reducing CO2 emissions while providing that energy. While energy efficiency plays a role in determining these numbers, simplistic straw-man arguments based on energy efficiency are a waste of time for anybody who really cares about the issues. If you are focused on minimum cost per kilowatt and reliability as the standard of power grid success I concur completely. If nobody digs up any fossil carbon, burns it, and dumps it into the global system, that’s fine. As long as that’s happening to achieve your “minimum cost per kilowatt and reliability as the standard of power grid success” the issue is much more complex. The ability of the global system to absorb fossil CO2 while not changing beyond the expected parameters is a global commons. As such, anybody who lives on the globe is potentially entitled to input in how it will be used. And how much. Solar PV is great! Solar PV is wonderful! Why don’t we remove all subsidies for it if it is so competitive as you say? Even diehard believers in CAGW like Dr. Tol note that solar power is terrible. As for the above: the magical step occurs even before the process you note: H2. Wow, the problems of harvesting, transporting and storing H2 are legion. Nice way to hide that by just assumptively closing. Solar PV becomes twice as wonderful every 5-6 years. Give it another decade. But most of the “subsidies” involve rooftop solar, which I’ve always said is a boondoggle. Another category error: utility solar is not the same as residential rooftop. Actually, most of those issues have already been worked out, and the technology is rapidly maturing. Not that I think it’ll work for passenger cars anytime soon. But for industrial applications, hydrogen’s no worse than, say, sulfuric acid. AK: Once again, considering only solar panel costs without talking about storage is disingenuous. You can have all the solar you want at $0 per kilowatt-hr but it still doesn’t solve your problem because exactly the same generating capacity is needed as backup as would be needed if no solar was on the grid. This because of…..drum roll please….NIGHT-TIME!!! And clouds of course. And if you have coal or gas plants as backup but only run them at night, their capital costs are covered by less output (since only running 1/2 day) and thus their cost goes up. Plus, ramping up coal and shutting down every day is hugely expensive and destructive to the equipment. To say “storage is coming” is not helpful. People have been saying storage is coming for 30 years and batteries are only marginally better now. Imagine the batteries needed to supply Chicago overnight! If your plan depends on a miracle it is not a plan. Craig Loehle: AK: Once again, considering only solar panel costs without talking about storage is disingenuous. This began with a reference by me, cited more usefully by AK in response, to an article on fuel generation by enhanced artificial photosynthesis. Fuel is a great storage option. Both of us addressed cost/effectiveness, I rather briefly. I don’t think you can read AK as advocating solar for everything right away, or as being disingenuous. Those people are really sick or they would not get scammed by this. This is how federal policy picks winners and losers. Out-of-state investors are pouring money into Iowa cornfields. Because this is sound energy policy? No, because the Federal government will confiscate money from taxpayers elsewhere and give it to the voters of Iowa in the form of subsidies. Warren Buffett announced that MidAmerican Energy, a Berkshire Hathaway subsidiary, is going to put $1.9 billion into new wind farms in Iowa….this new investment is going to put another 656 turbines into MidAmerican Energy’s wind portfolio. Since 2004, the company has already brought 1276 turbines into Iowa. So Iowans will embrace the “new energy” and prosper. Consumers and other taxpayers will foot the bill. “Old energy” states will suffer under the hobnail boot. Scientific justification not required. According to http://www.eia.gov/state/?sid=IA#tabs-4, it was 26% in August 2015. The NYT number comes from an optimistic rounding, Mr. Buffet’s strong point. OK, you win, they are not sick, they are getting rich at our tax payer expense. I prefer Al Gore any day. Joule, the pioneer of liquid fuels from recycled CO2, and Red Rock Biofuels, a leading developer of renewable jet and diesel fuel bio-refineries, today announced their intent to merge. Red Rock adds a proven technology pathway to Joule’s own Helioculture technology and strengthens Joule’s platform for global supply of carbon neutral fuels. The transaction is expected to close during the coming 30 days. In association with this merger, after a year of important service at a critical transition phase for the company, Joule also announced that President and CEO, industry veteran Mr. Serge Tchuruk, will return to his previous board role. Dr. Brian Baynes, a current board member of both Joule and Red Rock and partner at Flagship Ventures, will succeed Tchuruk and will lead Joule as it enters a commercial deployment phase. Red Rock Biofuels leverages a commercially proven Fischer-Tropsch technology to convert sustainably harvested biomass residues from forests and sawmills into jet fuel and diesel products. The company is poised to begin construction of its first refinery located in Lakeview, Oregon in early 2016. The project is supported by a $70 million grant from the U.S. departments of Agriculture, Navy and Energy, and the company has entered into substantial offtake agreements with Southwest Airlines and FedEx for the fuel that will be produced. Both companies appear to be innovations from (at least recently) Flagship Ventures, a major early-stage biotech investor. IMO what you’re seeing here is a bit of maneuvering, primarily financial, by a company whose major focus is other than biofuels/renewable energy. It’s quite possble they’re positioning to unload, but also quite possible they’re positioning to sell a top performer at a major profit. AFAIK, there’s no way to know, given how closely such operations play their cards to their chests. I must say, the solar power→fuel game seems to me to be much more tilted to the profit of solar PV than direct photosynthesis. But there’s certainly no way to know from what’s publicly available. I’d bet money the play there is the same as at Tesla: produce a product which is lossmaking, but offset it by squeezing through legislation mandating some percentage of “renewable” fuels. Tesla makes far more money from selling its Tesla electric car credits to other car makers forced to meet some arbitrary renewable vehicle goal than it does from actually selling its product, or perhaps the real product is milking government subsidies of which Musk is the grand master. Electric and hybrid vehicles do not make a difference today, but they are advancing knowledge and technology that will make a difference in the future. They build them and sell them to people who can afford them and it does nothing to hurt the rest of us. Any subsidies they get are in the noise and does nothing to hurt the rest of us. If it helps other car makers meet their unnecessary and unreachable renewable goals, that is only good for us. The other car makers don’t need to lie about meeting unnecessary and unreachable performance, like VW did, just to stay in business. The war on CO2 is really sick. Oil continues to bounce around between $40 and $45. The rig count for oil and nat gas is going down – we have large surpluses of both. Russia and Saudi Arabia are major crude oil exporting giants. Russia and Saudi Arabia produced more than 10 MMbpd (million barrels per day) of crude oil in October 2015 despite a 60% fall in crude oil prices since June 2014. 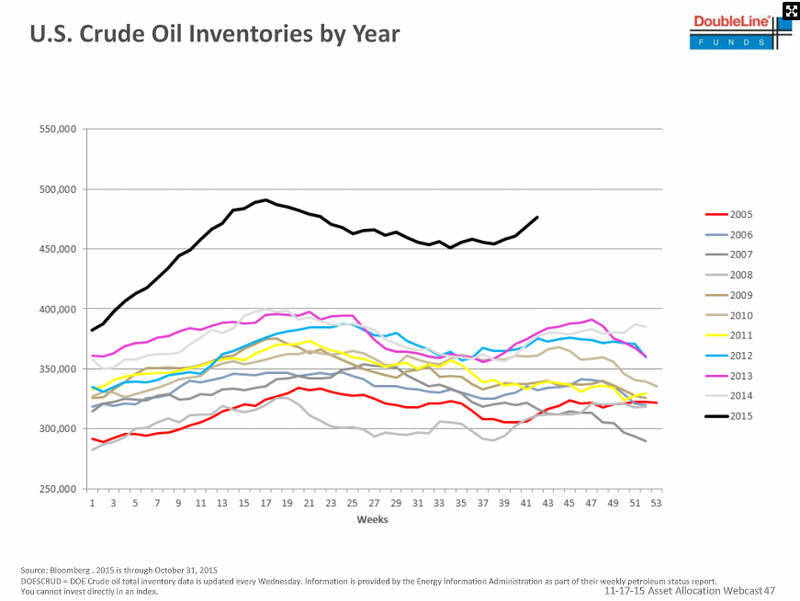 The record oil production and record global inventory are weighing on crude oil prices. Oil costs as much as Saudis want it to cost. 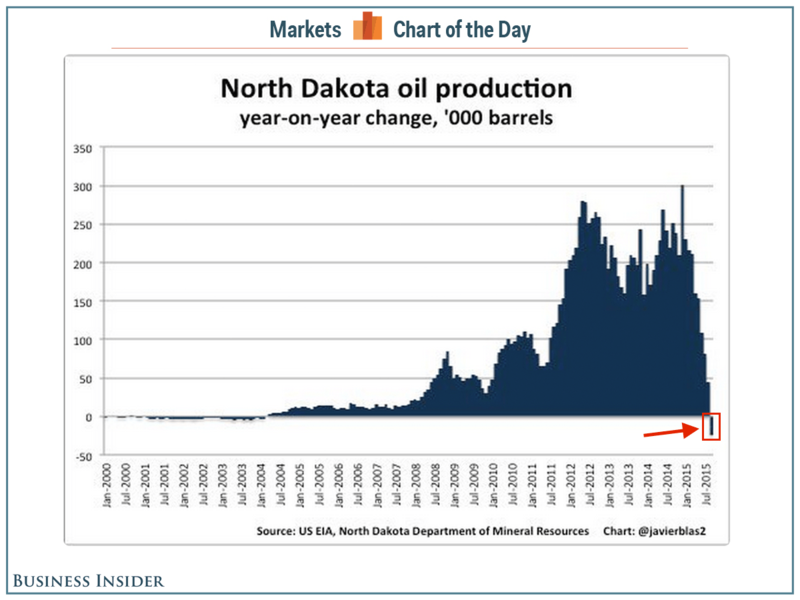 Shale boom over for now? TRR is Technically Recoverable Reserves. Prince Charles has no clue about natural climate cycles. He is correct that the. misguided, alarmism has likely caused a lot of the problems or made them worse. He apparently believes that earth population must be reduced. Keeping much of the poor from having affordable, abundant, power will accomplish the genocide that he needs. That means they will be left behind in following Germany in the race to ruin their economy by doing stupid stuff. Their most affordable energy comes from coal. Any more expensive path is stupid. I could try to say that more nicely, but that is not justifiable. Biggest story, not listed, is the Danish Meteorological Institute 30% sea ice extent graph running since 2005. It shows the highest level of Arctic sea ice ever for the last month. [ever being an effervescent word, but correct here in the sense that the graphs have only been running since 2005]. It correlates reasonably well with PIOMAS in that 30% thickness has a better relationship to volume than 15%. It indicates that PIOMAS is likely to jump up again this year against my previous expectations. It bodes well for continuing Arctic ice extent recovery, even in an El Nino year. Is there a problem with the other 15% data sets? some have not been updating for weeks on end and few seem to relate to PIOMAS and 30% measurements, even the DMI 15% graph. Perhaps evanescent or incandescent would have been better choices than effervescent, though it is a bubbly uplifting feeling having a marker go in the right direction.